Marion Blake in her home office at Manoir Westmount. For some, moving to a senior’s residence can be traumatic, for others it can be liberating, the right decision at the right time. Blake, whose field is linguistics and early language education, had moved to England as a visiting scholar after she lost her job in the 1980s. After leaving Toronto, she became a visiting scholar in education and linguistics at Cambridge University, then decided to stay on as a freelance editor—work she continues at a young and ambitious 87. Sitting in a reception area of the Manoir Westmount on Sherbrooke W., Blake says the move there made life much easier for herself and her six children, two of whom live in Montreal. She has four grandchildren. “They (my children) did not have to worry about how I was getting on, whether they needed to help with shopping or other daily needs. “I was gambler at heart and I took a gamble,” she reflects, happy to be close to the heart of Westmount with all its conveniences. “It could not be better. The Westmount library is next door—there is still a taxi driver who will remember picking me up at the library with this big pile of books.” She also enjoys the adjacent Westmount Park and the shops on the Sherbrooke strip between Victoria and Clairmont. 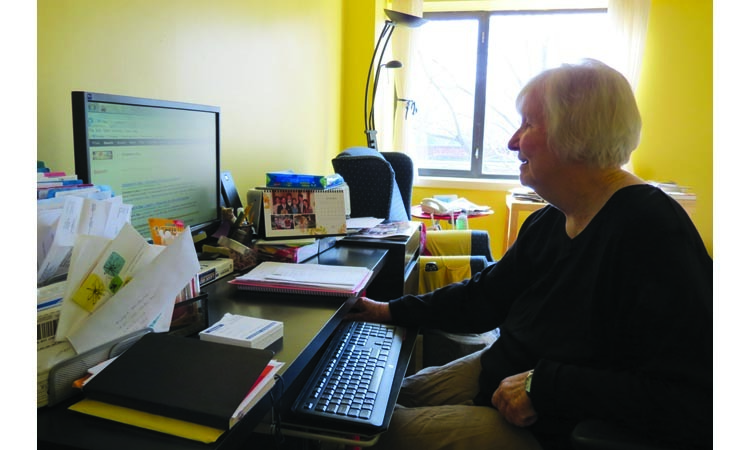 She credits the Westmount Rotary Club for building the Manoir—in spite of some neighbours’ objections—and maintaining it since 1979 as a non-profit, full-service facility. “I can afford to live here, while other residences would be just impossible for me,” she says. There is no means test required to get an apartment there, and no Westmount residency requirement. The cost—$1,971 to $2,015 a month for a standard room with private bathroom, before the Seniors’ Tax Credit—includes three meals a day and 24-hour-a-day nursing presence. There is a medical file on each resident and if one becomes more frail, the nurse will talk to relatives about other homes that offer more care. CLSC staff visit regularly. Blake says dining room staff are patient and get to know the residents, calling them by their first names. If you miss a meal, they will call to see if all is well. “They have a wonderful program of events to give people something to think about,” she says. There also are ample opportunities to assist other residents. Blake helped establish a “wellness month” at the Manoir. Blake does her work online—the computer has been part of her life since the early 1980s, when she bought her first Mac. Her second-floor apartment, with a picture window and a lovely view of trees on Lansdowne, resembles a writer’s studio, with a bed, computer table and lots of papers and books—the sign of a working editor. This is where she’ll be editing a book for Oxford University Press—Habits of Inequality, her latest assignment. “You get immersed in the subject, you get to learn so much!” she says. She volunteers her editing skills in a wide variety of areas—the campaign to eliminate landmines; assisting Catherine McKenty to edit unpublished work of her late husband, broadcaster/journalist Neil McKenty; and lightly editing graduate essays of female Inuit students who had to abandon the nomadic life of their families to live in villages so they could attend school. Blake is a doer. She is embarking on a campaign to establish a mobility rating for public buildings so seniors who use a cane, walker or wheelchair will know how accessible they are. This could also encourage owners and managers to upgrade access. “I’m always up for work,” Blake remarks, and with her positive disposition, and eagerness to help others, is an example of how productive and fulfilling life can be, at almost any age. “I’m lucky,” she says, with a knowing smile. Be the first to comment on "Editor gambled on moving to a Westmount residence … and won"